In a winter of cloud, the skies cleared for a magical night in the Alberta Badlands. Two weeks ago, on February 28, I took advantage of a rare and pristine night to head to one of my favourite spots in Dinosaur Provincial Park, to shoot nightscapes of the winter sky over the Badlands. A spate of warm weather had melted most of the snow, so the landscape doesn’t look too wintery. But the stars definitely belong to winter in the Northern Hemisphere. The main image above shows the winter Milky Way arching across the sky from southeast (at left) to northwest (at right). The tower of light in the west is the Zodiacal Light, caused by sunlight reflecting off dust particles in the inner solar system. It is an interplanetary, not atmospheric, effect. This is a stitch of 6 segments with the 12mm Rokinon lens at f/2.8 for 30 seconds each, with the Nikon D750 at ISO 6400, mounted portrait. Stitched with PTGui. 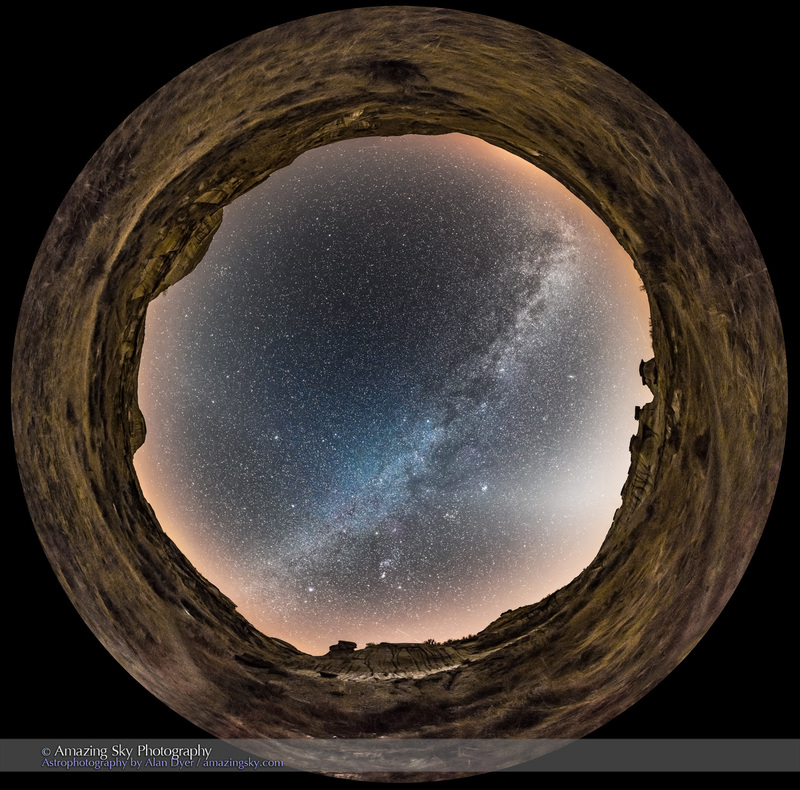 Above, this 360° version of the scene records the entire sky, with the winter Milky Way from horizon to horizon. With a little averted imagination you can also trace the Zodiacal Light from west (right) over to the eastern sky (left), where it brightens in the diffuse glow of the Gegenschein, where dust opposite the Sun in the outer solar system reflects light back to us. This is a stitch of 6 segments taken with the 12mm full-fame fish-eye Rokinon lens at f/2.8, all 30-second exposures with the Nikon D750 at ISO 6400. The camera was aimed portrait with the segments at 60° spacings. Stitched with PTGui using equirectangular projection with the zeith pulled down slightly. A rectangular version of the panorama wraps the sky around from east (left), with Leo rising, to northeast (right), with the Big Dipper standing on its handle. I’ve added the labels in Photoshop of course. 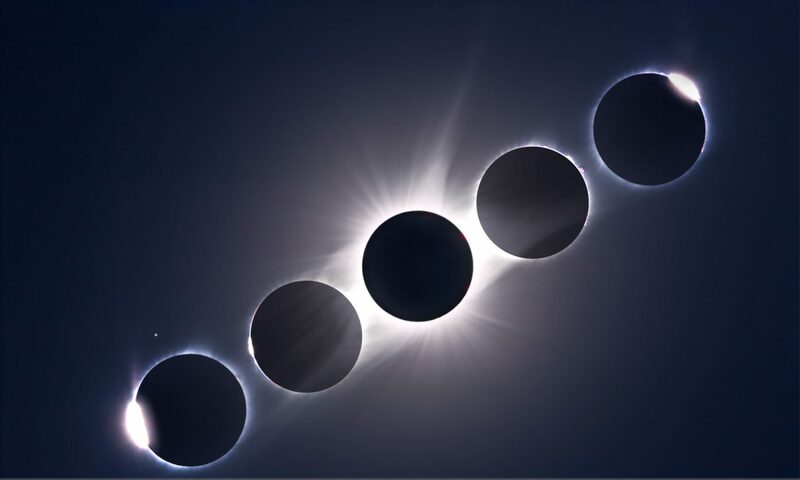 This is a stack of 8 x 30-second exposures for the ground, mean combined to smooth noise, plus one 30-second exposure for the sky. All at f/2.2 with the Sigma 20mm Art lens and Nikon D750 at ISO 6400. Here, in a single-frame shot, Orion is at centre, Canis Major (with Sirius) is below left, and Taurus (with Aldebaran) is at upper right. The Milky Way runs down to the south. The clusters M35, M41, M46 and M47 are visible as diffuse spots, as is the Orion Nebula, M42, below Orion’s Belt. The late winter evening Zodiacal Light, from at Dinosaur Provincial Park, Alberta, February 28, 2017. This is a stack of 7 x 30-second exposures for the ground, mean combined for lower noise, plus one 30-second exposure for the sky, all at f/2 with the 20mm Sigma Art lens, and Nikon D750 at ISO 6400. This is certainly my best shot of the evening Zodiacal Light from my area in Alberta. It is obvious at this time of year on moonless nights, but requires a site with little urban skyglow to the west. It is best visible in the evening from northern latitudes in late winter and spring. Here, Venus is just setting above the badlands landscape. The Andromeda Galaxy is at right, the Pleiades at left. The Milky Way runs across the frame at top. There is a common belief among nightscape photographers that the Milky Way can be seen only in summer. Not so. What they mean is that the brightest part of the Milky Way, the galactic centre, is best seen in summer. But the Milky Way can be seen in all seasons, with the exception of spring when it is largely absent from the early evening sky, but rises late at night.